The recipe below can be followed exactly, but where is the fun in that? Use it as a jumping-off point. Adjust the spices and ingredients to make it your own. Or, like me, make it differently every time. I call for one jalapeño below, but feel free to use more, less or some other pepper. In fact, the batch pictured featured a mild Hatch pepper augmented by about 1/2 teaspoon of red pepper flakes. 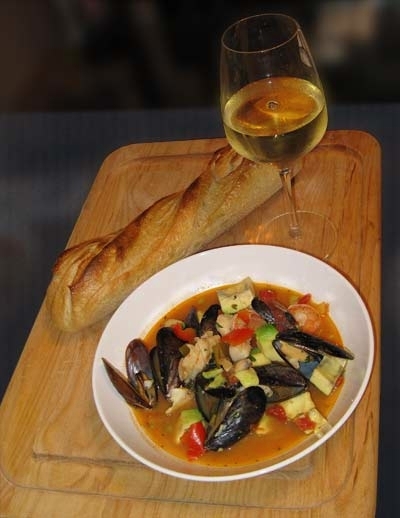 Make sure to serve this with a tasty white wine and lots of crusty bread to soak up the broth. We had a sourdough baguette, fresh out of the oven, and a 2006 Bodegas Godeval Valdeorras Viña Godeval. First introduced to us by Ferry Plaza Wine Merchant, this Spanish white earned a 90-point rating in the October 15, 2007 issue of Wine Spectator, as one of its “Smart Buys.” This is one of my “go-to” white wines so we usually have a few bottles around the house. While it probably would not be the perfect pairing for this dish, it was pretty damn good with it. That pretty much sums up why we always keep it around, it plays very well with food. This wine has a little bit of everything, nice acidity, some pear and quince-like fruit, some citrus, a little minerality, and some spice, all tied together with just the right amount of bread flavor from the lees. Think Muscadet’s bigger brother. Oh, and did I mention it costs less than $20? Another great pairing for this dish is Albariño. Planted in over 90% of the vineyards of Spain’s Rias Baixas Denominacion de Origen, the bright acidity in Albariño makes it a natural with shellfish. If you have your own great seafood recipe, you might just win two tickets to the 36th Annual People’s Choice Awards® in Los Angeles, in the Rias Baixas Albarino Wines Recipe Contest for Home Chefs. Grand prize includes transportation, overnight accommodations (valued at $1,500) and a dinner for two at The Bazaar. Two runners-up entries will each receive a $250 Williams-Sonoma® gift card. All three winners will have their recipes featured on the Rías Baixas Albariño website. If you don’t have your own recipe, you still have a chance to win. Just vote for your favorite of the 2008 contest recipes, and you’re automatically entered. For details, visit www.riasbaixaswines.com. Shell and devein the shrimp, reserving the shells. Clean beards from mussels if needed, rinse all seafood in cold water, sprinkle with a little salt, and return it to the refrigerator. In a large skillet, melt a couple of tablespoons of butter over medium-low heat and add your shrimp shells. Once they get good and fragrant add 1 tablespoon of the smoked paprika and stir continuously for about a minute. Turn the heat to medium and keep stirring just long enough for the pan to get a little hotter, then deglaze using the wine. Once all the good stuff is off the bottom and the wine is bubbling nicely, remove from heat and strain all of the liquid and discard the shrimp shells, while retaining the liquid for later. Wipe out the pan and return to medium low heat. Melt a tablespoon of butter in the pan and add pinch of salt to start sweating the onions. Once they start to get just a little translucent on the edges, add the peppers and any seeds you plan to use. Toss in the bay leaf and stir frequently until all vegetables are tender. Turn heat up to medium and add the rest of the paprika and stir continuously for about a minute. Deglaze with the reserved shrimp/wine liquid, and then add the chicken stock along with the thyme, oregano, rosemary and coriander. Simmer and reduce by half. Once reduced, add the parsley and the zest and juice of one lemon. Increase the heat to bring it to a boil. When liquid begins to boil, add the seafood, cover and reduce the heat to med-low. Cook for about five minutes, then uncover and remove from the heat. Zest and juice the remaining lemon into the pan, stir in the cilantro and the avocado right before serving. — Joe Power is the editor and publisher of Another Wine Blog. A misspent youth and a failed attempt at Rock and Roll superstardom left him with little choice but to turn to a life of drink. He claims to not be under indictment at this time, and a quick check shows no outstanding warrants. Don’t forget lighter reds for your seafood. Wish I read this yesterday, I could have done with the recipe. I was trying to make some sort of seafood medley pasta dish. I ended up with a tomato based shrimp and squid sauce. Didn’t fancy the traditional white (but if my local had an Albarino would have gone for it) so I grabbed a bottle of Dom Colombier Chinon… chilled it ever so slightly and found it to be really nice pairing to the seafood/tomato medley. seafoods are great because they have lots of the mineral iodine which prevents goiter~..